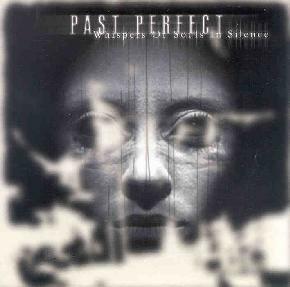 Past Perfect - "Whispers Of Souls In Silence"
Hailing from Greece, Past Perfect crafts a dark blend of metal, progressive rock, electronics, and atmospherics, that is very accessible without ever being overly commercial or formulaic. Whispers of Souls in Silence would seem to be a concept album, as it’s divided into four chapters, each with one or two songs in them, but the lyrics aren’t printed in the liner notes, so I’m not sure what the concept is. That, however, did not prevent me from thoroughly enjoying this engaging trip into darkness. Through a haze of ambient sounds and weird wailing guitar on the opening track, The Invitation, ghostly voices chant "welcome...welcome", and things are underway. Through the moody Sound of No Frequency and the dark, intense groove of If, guitarist Elias Raptis pulls off some deliciously eerie licks. Sound of No Frequency breaks into a throbbing almost electronica bit in the middle, foreshadowing the conclusion of the album, but If is pure, hard driving rock. Bassist Babis Diakouimeas also provides the lead vocals, which reminded me a bit of the sound of Steve Wilson’s voice (which I’ve always liked). In fact, if I were to compare the sound of Past Perfect to any other band, I would compare it to Porcupine Tree, especially the album Signify, achieving the oft-mentioned but never quite succeeded attempts by PT to fuse classic rock with modern techno and rave music. Deliverance follows, with a hyper electronic rhythm layered with the melodic vibraphonic sound, broken up by atmospheric bass meditations, which leads into the shadowy, fractured, nightmarish Lethe, which injects a heavy dose of Eastern psychedelia into the mix. The final two tracks delve much more deeply into the electronica influence, Our Fatal Dream Tale even taking on a bit of a Portishead sound, with haunting, dream-like piano, liquid electronics, and thin echoing beats, while A Dream Within a Nightmare is sinister throbbing techno. This may sound like a lot of clashing influences and styles, but Past Perfect pulls it all together for a dazzling, mysterious and heady brew of modern progressive rock. For more information you can visit the Past Perfect web site at: http://www.pastperfect.gr. Whispers Of Souls In Silence is distributed by Cyberdelia Records. You can visit their web site at: http://www.cyberdelia-records.com.